Efficient weight exercises at home can be tricky to do safely. Doing strenuous workouts like squats and bench presses in your home gym without a spotter or guidance can be risky. That’s why a power rack is commonly the centerpiece of a complete home gym. Read on to see some of the pros and cons of the best power racks on the market today. An unbeatable, out-of-box experience at an affordable price point, the Multi Purpose rack is the best cage on the market. A great machine with few bells and whistles. Uses a good, visually appealing cage with a wide range of storage options. A solid rack with one of the lowest prices on the market. This is an excellent pick if you’re on a budget but are still looking for a quality machine. For more personalization, this is a step-up model with very high customization potential. However, this potential drives the price up. The best choice for a large number of exercises like cable crossovers, lat pulldowns and more. A wide range of height options makes this a versatile choice. Commercial-grade construction, good standard features like high/low pulleys, and a versatile design for a wide range of workouts. One of the most appealing designs on the market. Great six-plate storage pegs for better organization. An impressive level of customizability and versatility. A sturdy and striking design that’s nice to look at. Smart, space-saving features and a compact frame make it perfect if you’re short on space. Extra long vertical racks with incremental rungs offer a lot of height adjustability. Comes with fewer accessories than you might expect for the price. Might need a few add-ons like resistance bands. Pretty basic out of the box with few standard features. May require buying a few add-ons for versatile use. No real bells and whistles Lacks floor mounting options and good customization potential. Additional options can quickly push the price up. You should consider different options if you’re on a specific budget. Base price can seem a bit high compared to similar compact models. Optional features increase the price even more. Safety. Power racks offer protection against accidental drops and failed reps. The design of these racks provides a ledge point to catch a bar in case something goes wrong. This feature makes power racks a great addition to a home gym where you may be working out alone. Built for many workouts. From the upper to lower body, home gym power racks have you covered. Allowing you to perform safe squats, bench presses, overhead presses, deadlifts, pull-ups, and more, these are versatile machines. Pushing your limits. The natural efficiency and stability of power racks allow you to elevate your workouts far beyond what you’d be able to do alone. The confidence that you’re covered in the event of a failed rep can give you extra breathing room to go for those PRs. Customizability. These racks allow you to use them for the exercises you want, especially when attachments and additions come into the mix. For example, some racks can add an attachment for tricep dips added to their frames. Brand dependability can be a great place to start when looking for the best power cages. Here are some of the best brands in the business. Established in St. Petersburg, Florida in 2006 and famous for their BD-Line, Valor has earned its reputation as one of the most durable rack manufacturers around. Headquartered in Compton, CA, the CAP logo is on many popular models of commercial gym equipment. The company is known for their Full cage. One of the newer companies on the market and known for their T-2 series, Clearfield, Utah’s Titan has taken the market by storm since their founding in 2015. $200-$400: Usually more barebones home models. Some models include small accessories or optional upgrades. $400-$650: Midrange options, usually including a few more accessories or features for additional exercises. Better, more intuitive designs. $650-$1,250: Commercial models that come with attachments for ultimate customizability. Professional-grade designs and durability. Built to stand up to continuous, heavy abuse. This is the largest and most versatile type of power rack, often with four to six posts to keep it stable. Common for home use, these racks are also the most customizable with many options for add-ons and accessories. For a home gym, these are a safe bet. Designed for heavy use in a gym setting, these are the most modular and heavy-duty racks on the market. They can often anchor to the floor with bolts for added stability and include different customizations and modules for creating variable workout stations. One of the most important safety features of a power rack. These bars act as a safety in the case of a failed rep. 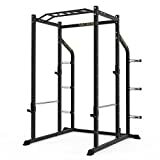 Highly customizable, they can be positioned in different spots on the rack for different workouts, skill levels, and heights. Keeping the entire rack from moving, swaying, or tipping during a workout, these bars help to maintain a rock-solid workout. This addition usually attaches near the bottom rear of the rack to protect you and the equipment around. Good stabilizers also dampen annoying movements in the middle of a set. These are the vertical rack bars that set the maximum safe height and are a major part of the security/customizability of the rack. The rack bars are usually about three feet high but will vary in terms of increments and spacing for mounting. If keeping an uncluttered workout space is important to you, extra storage is helpful. Most racks will come with bars or smaller racks to store your bar weights when not in use. Some racks will come with additional accessories that can make workouts easier or let you try new lifts. Common accessories include bands for additional resistance, benches for workouts that require sitting or laying down, and J-cups to hold the bar in place when not in use. Size: Between home models and commercial racks, a typical dimension is around 6x3x3 feet. On top of the footprint of the rack, a few feet of buffer space around the machine will keep you safe and comfortable. Remember that the size of your bar can impact the total width of the setup as well. For reference, Olympic-style barbells are 7.2 feet. Weight: All racks have safe weight capacities. When considering different options, remember that the limit of the rack needs to fit or exceed your weight plus the lifting weight. The gauge of the steel in the rack’s frame will have a major impact on its capacity. Budget models will often use lighter 14-gauge steel, while higher-end and commercial models will use heavier 11- or 12-gauge tubing. Customizability: The amount of customization you need from a rack largely depends on you and the range of workouts you expect to do. More advanced racks will offer more customizability and additional options. Safety: One choice to make is whether or not you need a rack that can be anchored to a lifting platform. If you want to do specific exercises like kipping pull-ups, anchoring will be necessary to keep you and the machine safe. Again, consider the range of workouts you expect to do on your rack. Shipping and assembly: These are big machines with a lot of heavy construction, so shipping is often bulky and expensive on power racks. Check to see if your rack offers free shipping. If not, factor in shipping as a significant portion of your total cost. There can also be a lot of assemblies involved due to the complexity of these racks. Average assembly times are between 30 minutes and two hours. In terms of an out-of-the-box experience at a great price point, the Marcy Olympic rack takes it here. 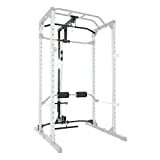 Boosting your ability to adjust your workout equipment, this rack features a commercial-style bar catch for easy transitions and excellent protection. Commercial-grade steel gives you unparalleled durability. It also comes with features uncommon for this price such as weight plate shelves for easy storage and pulleys for an even wider range of workouts. Five different workout stations are available right out of the box. A disadvantage of this rack is a lack of additional accessories (bands, benches) that are common at this price point. This can put additional strain on your wallet if you’re looking to customize or stretch the potential of your machine. If you’re looking for a solid rack at an absolute rock-bottom price, the 810XLT is your pick. An eye-catching black and raw steel design is just the start of things that will catch your eye. The 2×2 sq.ft steel frame keeps its footprint low. 19 adjustable bar heights give you a high level of customization and comfort. The optional bench opens up even more doors for this incredibly solid machine, as do four optional equipment attachments. The lack of bells and whistles along with no floor mounting options limit the additional potential of the rack beyond the base setup. This can decrease the overall number of workouts available to you on the rack. The ARCHON Power Cage offers arguably the best-looking power cage on the market. It’s also one of the most organized. 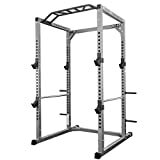 A sleek, athletic-looking design makes this rack look professional and at home in a proper gym setting. A deep interior gives you a lot of room to move while inside. The class-leading six-plate storage pegs will organize all of your weight seamlessly. ARCHON is actively innovating new workouts to use with this rack, with new additions coming on the market even after its release and further into the future. A downside is that it’s admittedly pretty basic out of the box, with no accessories or additions to use on day one. Be conscious of the workouts you plan to do and what accessories are required for them. This can help you get an idea of the total price of the necessary setup. Good step-up features along with a high degree of adjustability make this our star honorable mention. A compact, 2×2-foot design, along with four storage pegs, make this a fantastic pick if you’re conscious of space. The bar height can go up to 68 inches to accommodate many different exercises. This machine also comes with the optional addition of lat pulldown stations and cable crossovers, which can turn this into an entire home gym. The major drawback, however, is the major increase in price these extravagant additions carry. This can be a limitation if you’re budget conscious while looking for a complete home gym. A good overall package with some insane additional options put this pick on the list. With the basic model, you’re looking at a pretty barebones package with a few nice features: a compact frame, four plate storage pegs, and 26 variable positions. The option to add lat pull stations and/or cable crossovers turns this machine into a more versatile rack to workout extra muscle groups. This is a good pick if you’re looking to get an entire workout routine out of just one rack. These extra features make the price of the rack go up to the top of the power rack price range. Like the BD-7, this isn’t the most budget-friendly option unless you can make do with just the base model. The main purpose of power racks is to provide a safe and stable workout. To get a similar workout experience with other pieces of equipment, you have a few options. Squat stands are sets of two adjustable, vertical posts to hold the bar in place when not in use. However, the support pretty much ends here, and these stands don’t protect you from fall damage or guide your lifting form. These are wall-mounted bar holders that take up minimal space but require a large section of wall. These machines do include spotter arms for safety but lack additional security or efficiency features. These are free-standing frames that also save space and are similar in size to wall mounts. Additionally, the best half racks will offer more mounting space for weights when not in use, making them quite versatile. Power racks have the advantage in safety, workout variety, stability, and customization over the rest. Racks can protect you from fall damage and can tackle different types of lifts. These include bench presses, heavy squats, overhead presses, and pull-ups. You also will get options for additions and substitutions other options just don’t offer. Want to get the most out of your power rack experience? Check out these tips to maximize the workout potential. A garage is a great place for a power rack – flat, solid surfaces are always optimal. If your machine comes with weight racks or pegs, space them evenly on both sides for balance and stability. If your mounting holes aren’t labeled, label them yourself for convenience (using vinyl numbers, tape, or permanent marker). Keep both sides of the cage level to stay stable. Q: What else do I need to buy when setting up a power rack? A: This will largely depend on both what comes with your rack and what types of exercises you’ll be doing. A bar is essential if the rack doesn’t come with one, and a bench opens up many new workout possibilities. On top of this, add-ons for your rack, along with smaller accessories like resistance bands, will configure the rack to your workout style. Q: How do I determine what size of a rack to buy? A: First, measure the space you plan to put your rack in. Be sure to include a foot or two of buffer space around it. Second, consider your size, as this can influence the amount of space you will need. This will improve your safety and comfort. Q: How easy is a power rack to adjust? Q: What tools are necessary for assembly? A: This will definitely vary by model. Generally, the best home power racks will be more user-friendly and easy to assemble. Commercial racks come with performance, durability, and stability in mind. They may also require more assembly. Most racks will list what tools you need in the product description or even include the tools with the rack. If not, check out the owner’s manual. 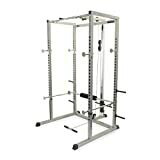 Overall, the Marcy Olympic Multi Purpose Strength Training Cage provides an absolutely unbeatable day-one experience. The Fitness Reality 810XLT offers a solid model at a price that’s friendly on the wallet. All of these picks will give you a safer, more efficient home workout. Have you used any of these picks or are looking into buying a power rack? Agree with our choices? Let us know in the comments below!